Posted on November 24, 2010 by Jill B.
It’s one of the latest products in a slow but steady stream of USB 3.0 devices and it’s ready to hit store shelves and online shopping carts—it’s the Kingston HyperX MAX 3.0 External USB 3.0 Drive. Along with offering a SuperSpeed connection, the blue aluminum HyperX MAX has an added perk for storage capability in SSD. While it looks quite similar to a standard 2.5 inch HDD, SSD means that there are no moving parts in the external USB drive. The more moving parts there are, the greater the risk of malfunction. A lack of moving parts also means that the device is silent. You won’t hear the spinning or whirring often accompanied by traditional hard drives. SSD drives will reduce the amount of energy used as well. Kingston’s HyperX MAX USB 3.0 SSD drive is aimed at prosumers and other creative professionals who work with a lot of data and who acknowledge that time is money. The HyperX MAX claims to boast read speeds of 195 MB/s and write speeds of 160 MB/s when USB 3.0 connectivity is implemented with a SuperSpeed motherboard or expansion card. The memory maker offers examples of its data transfer speed. It tested a 10GB movie file that transferred to the drive in one minute and 12 seconds. Plugged into a USB 2.0 connection, the same file took just under six minutes. Kingston says that 475 mp3 files transfer in 20 seconds with USB 3.0 while high speed takes one minute 16 seconds. A dual LED indicator will display in two different colors based on the interface you are using. While these results are impressive, your own actual transfer times will likely vary. Depending on your own computer setup, results could be slower. The HyperX MAX USB 3.0 SSD is only compatible with Windows systems. While one article claims the life expectancy to measure approximately one million hours (or just over 114 years), Kingston offers a three year warranty with around the clock support. 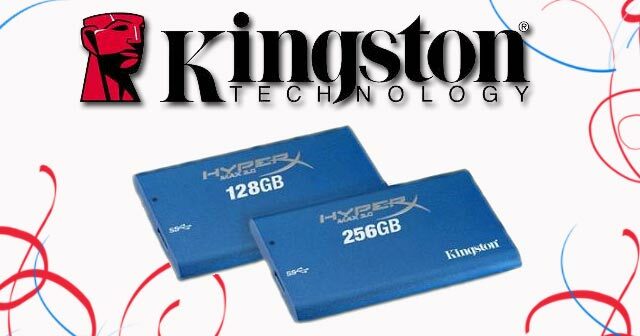 MSRP information has yet to be released but expect to see HyperX MAX in 64GB, 128GB and 256GB from authorized online and in-store Kingston retailers. Considering the drive’s USB 3.0 interface, storage capacities and SSD technology, it will likely come at a steep price. What do you think about the implementation of SSD and USB 3.0? What specifications do you look for in an external hard drive? This entry was posted in Articles, External Hard Drive, Kingston Technology, Portable Hard Drive, SuperSpeed USB 3.0, USB 3.0, USB Storage Drives and tagged External USB 3.0 Drive, HyperX MAX, HyperX MAX 3.0 External USB 3.0 Drive, HyperX Max USB 3.0 SSD, Kingston HyperX Max USB 3.0 SSD, Kingston HyperX MAX USB 3.0 SSD drive, Kingston USB 3.0 SSD, SSD USB 3.0 drive, USB 3.0 SSD. Bookmark the permalink.